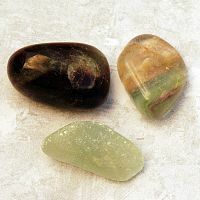 - A set of three tumbled fluorite gemstones. 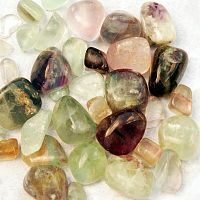 Stones will vary in size and shape, but most are in the range of 1/3" to 3/4". Fluorite can occur in a wide range of colors, but the most common are bands of glassy green and purple. Flourite is a stone of concentration, logic, discernment, responsibility and impartial reasoning. Do you have any other questions about our Fluorite? I ordered Flourite and I am amazed at the quality of stones I received, and the price was fantastic. I love this place, I'll be ordering again.